This PDF 1.5 document has been generated by Microsoft� Word 2010, and has been sent on pdf-archive.com on 02/04/2011 at 12:33, from IP address 143.238.x.x. The current document download page has been viewed 5174 times. File size: 3.3 MB (21 pages). I am Edouard Fourmaux Lainé, 18 years old boy, born in France. 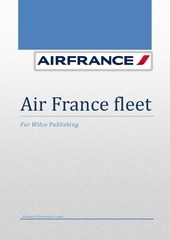 are with the new Air France Livery. with High Definition pictures and painting. especially with Precision Manuals Design Group (PMDG). with the Wilco Publishing team in the future. SkyTeam livery. I will find screenshots of this repaint at the very end of this document. This file has been shared by a user of PDF Archive. Document ID: 00029683.